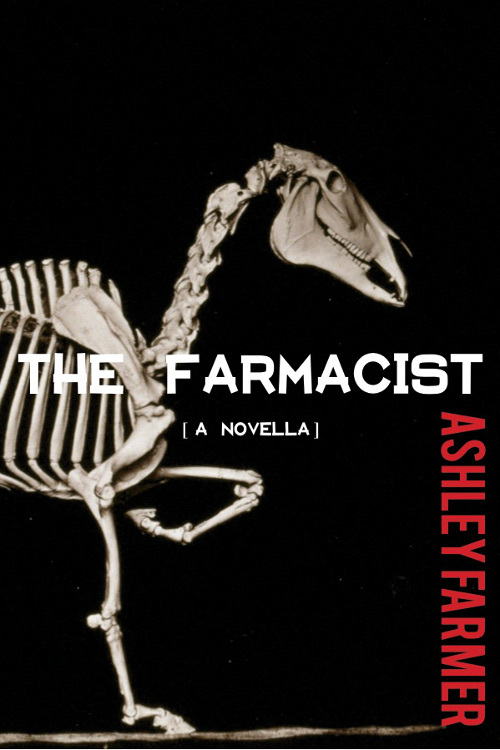 The Farmacist, by Ashley Farmer. Jellyfish Highway Press, November 2015. 80 pages. The digital is often framed as a site of contagion—one can contract fatal viruses (or send them). One can suffer the pollution of good ol’ American values—the allure of exotic chrome and pixels from the Silicon Valley proving altogether too enticing. Indeed, the Valley itself was once good ol’ American farmland, before wresting technological eminence from Route 128 in Massachusetts. But one can also “go viral,” become contagion itself; one can colonize digital space as imaginative playground and bend its offerings to one’s own designs, just like a virus; one can even farm online. If the digital can be named any one thing, it is ever-replicating multivalence, which passes from vector to human vector, becoming at once a thing and its antithesis, simulacrum and simulacra, sanctuary from danger but also danger itself. Ashley Farmer’s The Farmacist suggests by its title an affiliation with digital contagion—perhaps as an offering, a written prescription for our complicated diagnosis. Yet there is nothing prescriptive about its approach. Rather than tease a dichotomy between good and bad contagions, Farmer forces her readers to rethink both the charming idealism of a tech-utopia, as well as the privileges afforded “authenticity,” or the real. After all, does the computerized drip-irrigation of a farm render it unreal? And how much of Farm Town—an interactive digital pastoral available via Facebook—actually remains constrained within that fabricated digital? At one point, Farmer’s protagonist is wearing a mask, the classical marker of (in)authenticity: “But when I pulled it off,” she says, “my real face was absent. In its place: an arrangement of hashtags. Put it on again.” There is no cathartic reveal, no affirmation of the real versus the unreal, or triumph of one over the other. There is not even a change of state—the mask returns to the face. There are no truths resting, hidden, behind it. Yet Farmer’s tale resists modernist nihilism as well, and the mask’s failure to unveil truth, health, salvation, does not fatally condemn its wearer, nor her world. Every action in The Farmacist is hemmed in by margins of error, as characters seek “an approximation of heaven,” or are entreated to “walk towards me in beta” (emphases mine), though these margins are perhaps less boundaries and blankspaces than liminal incubators. Early on, the narrator insists that “This Bird of Paradise is not a bird,” a play on Ceci n’est pas une pipe; but where Magritte’s distinction is between pipe and mere image of a pipe, a Bird of Paradise was in fact never a bird, and has only ever borne passing, somewhat idiosyncratic resemblance to a bird. Whatever its image, it is a full organism unto itself; approximations of heaven and walks in beta are not only loose scrawls within the margins of error, but vibrant non-Euclidean spaces in their own right. Of course, we cannot mistake this elaboration for pure celebration: “A bird is a bird,” writes Farmer, “if there are any left besides these seagulls mistaking parking lot for ocean.” Clouds, too, shift into pixel-governed geometry. And if the allegedly unreal—the images and the Birds of Paradise—are entities unto themselves, these are identities paradoxically dependent upon the pipe, the bird, the farm. Separate and whole but impossible without some other, brotherly whole. The worlds within and without Farm Town are seeded into one another, inextricable, mediated. They are worlds of no dichotomies, no extremes. Of course, if these worlds suffer no fatal condemnations (only minor disillusions and farewells, which no worlds are without), they also cannot offer definitive answers; the pharmacy has no prescription for this. Perhaps we must reconsider our etiology. Narratives of the digital immediately call to mind their frontiers of contagion—the encroachment of the digital on our fair, pastoral lives. To focus on Farm Town, also a fair pastoral, casts doubt on the distinction between the life before and life after, that distinction which so critically undergirds our narrative trajectories, all frontiers and the famous (American) Dreams that both inspire and require them. For what reasons does one press the frontier and venture into digital escapism? Is it escapism if one ends up, within a reasonable margin of error, exactly where one began? If these frontiers require pure difference, what becomes of our narratives once one’s margins become tidal, sharing jetsam—or become tectonic, and actively overlapping? In The Farmacist, a robot attempts to connect to “nature,” to “neighbor,” and to “NASDAQ,” juxtapositions sardonically neoliberal. One of these is not like the other, an invader. But separating nature from NASDAQ crucially fails to address their many linkages, some of which are visible and concrete, some of which are imagined and visualized. These linkages complicate the etiology of our disease (if it is even a disease; perhaps this is not a disease but an image of a disease but simultaneously an entity entirely separate from disease) perhaps less an indication of contagion, and more a congregation of multiple, multiply constitutive valences. After all, The Farmacist never suggests that it is about losing good ol’ American values, nor returning to them. The world beyond Farm Town filters through the narrative in apocalyptically tinged fragments, refrains of drought, of the barren West; Farm Town is never a devious ploy, and this story is not about lapsarian temptation. From its introduction in the prologue, it is already embarrassing, sentimental, “a commemorative Woody Guthrie plate bought by calling a 1-888 number on the TV screen”—an interesting anachronism, given Facebook’s plentiful, Web-based native advertising. If Farm Town’s commitment to nostalgia goes unrivaled, however, Farmer writes, “it is also a sincerity.” Nothing is “mere” artifice. You are two places at once: your bed and your Farm Town plot. Blisters on your hands pop. Mika Kennedy is a PhD student in English at the University of Michigan, where she studies environmental justice literatures and Pacific/West Coast salmon. Atlantic sturgeon aren’t bad either.